Welcome to Frankfurt! Upon arrival, you will go through customs and immigration. Should you opt to purchase a transfer to your hotel; a representative will be waiting for you as you exit immigration. Arrive at your hotel, check in and do not give in to jet lag! There is so much for you to see and do. Begin the afternoon in Old Town, the city`s backbone and where some of the most important sights are found. One of them is the City Hall, or Romer, like the Germans call it. 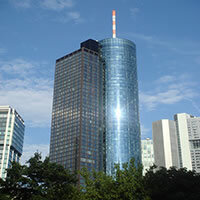 The building is composed of three main structures: Alt-Limpurg, Zum Romer and Lowenstein. The Gothic façade, with a richly ornamented balcony, has become the official emblem of the city. Right in front of the City Hall is the Romerberg square which is surrounded by numerous cafes and shops. Stop in one of the cozy cafes for a bite while taking in the atmosphere of the area. 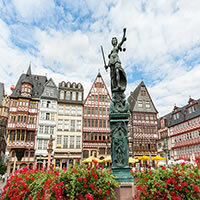 After a break, we recommend you take an optional tour such as `Frankfurt City Hop On Hop off Bus Tour`. The multilingual city tour in 10 languages offers you interesting commentaries on the Main metropolis. Enjoy the sunshine and sights from a superb vantage point on the upper deck. Hop on and off as you please and discover the numerous aspects of Frankfurt. 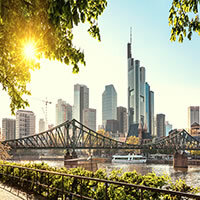 To finish off the afternoon, head to Maintower at sunset and enjoy the view from the observation platform some 330 feet above the streets of Frankfurt. The bar and restaurant here opens at 5:30 and is a lovely place to have a pre-dinner drink. As night falls, venture over to the banks of the river Main. 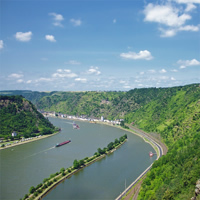 As you walk, notice the 19 bridges along the river that unite the banks, the most popular being the Eiserner Steg, or the Iron Bridge, it connects the center of the city with the Sachsenhausen district. In summer, open-topped boat bars line up along the river banks and many of the restaurants offer outdoor terrace seating with a view. 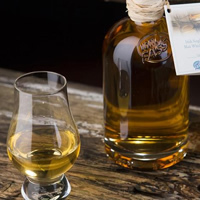 Find a cozy spot and enjoy some of the local specialties as you wind down your day. Wake up early today and head to Kleinmarkthalle, the food hall for locals that has been a permanent staple in the building since 1979. 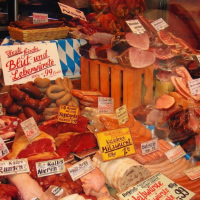 The concept here is between a traditional market atmosphere and a modern melting pot of international specialties. Aside from the many regional specialties available, you`ll find a fantastic assortment of international delicacies. Take in the local sights, sounds, and smells and make sure to indulge in the delicious specialties freshly prepared and offered on-site. 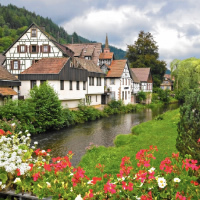 While you are in the area, we suggest you spend some time on Zeil, Frankfurt`s main shopping street, or on Goethestrasse, dotted with German and international luxury boutiques. This is a great area for shopping, as well as to enjoy some lunch at one of the many charming cafes. After lunch take a walk along the river Main along the `Museum Embankment` (Museumsufer) where some of the best museums in the country preside. Here you`ll find museums ranging from applied arts to architecture to film, fine arts, Jewish history, antique sculptures and much more. 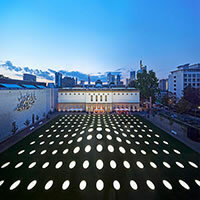 One of the most prominent museums is the Städel, which includes work from Botticelli, Duerer, Picasso and Matisse. Make some time to check out one, or as many museums as time and interest allow. Wind down your day with some dinner and drinks on the left bank of river Main, the Sachsenhausen quarter. Its cobbled streets are lined with cider taverns that serve an apple wine, sometimes called Ebbelwoi. The wine always is poured from a blue-and-gray stoneware jug into glasses embossed with a diamond-shaped pattern. The taverns display a pine wreath outside when a new barrel has arrived. These taverns usually serve traditional meals; hard rolls, salted bread sticks, and pretzels for nibbling are on the tables, too. Finish your evening with a concert at the Schauspielhaus or a play at the English Theater, which brings productions from Broadway and London`s West End to Frankfurt. Begin your day at one of the most wonderful museums of Frankfurt, the Goeth House, an absolute must-do. It is the childhood home of Wolfgang von Goethe, the author and birthplace of Germany`s greatest writer. The house, where Goethe was born and lived until 1765, was built in the typical 18th-century bourgeois style and is decorated with period furniture and paintings, providing an authentic feel of his life. 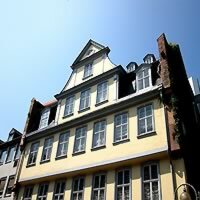 Next-door is the Goethe Museum, a 14-room gallery showcasing artworks from the writer`s time, including masterpieces of the Late Baroque and Romantic periods. In the afternoon, head to the Palmengarten, a botanical garden dating back to 1868. It is set in the magnificent West End, the former Jewish quarter of Frankfurt with numerous villas and lovely quiet streets. The Palmengarten features 50 acres of interesting and beautiful plants and offers a variety of activities including guided tours, summer concerts, evening festivals and exhibitions. After enjoying the peaceful gardens, make your way to the Hauptwache, one of the busiest pedestrian areas in the middle of the city. This area is famous for its mix of fine historic buildings and modern structures. The most notable building is the Baroque Guard House after which the square is named. Built in 1730, it once housed the city`s militia, a prison, and later, a police station, and now serves as a café, don`t miss the chance to have lunch in a historical building. 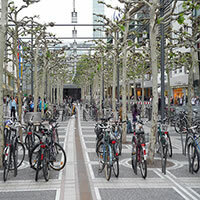 The square itself is one of Frankfurt`s main shopping areas, complete with a large underground mall. If time allows, stop in for a visit to the Frankfurt Cathedral. This church has special meaning because of its historical importance in the days of the Holy Roman Empire. The cathedral was begun in the 1300s and 1400s in the Gothic style, and has been faithfully rebuilt twice (once after a fire and then in the 1950s after the war). This is one of the only a handful of churches in Germany to be designated as an Imperial Cathedral, it was here from 1562 to 1792 that the coronation of Emperors took place in the Election Chapel. Beneath the tower is the magnificent Crucifixion by Hans Backoffen, sculpted in 1509. Other highlights include the grave-slab of King Günther von Schwarzburg, who died in Frankfurt in 1349, as well as numerous carved side altars dating from the 15th and 16th centuries. The cathedral`s most important relic is the skullcap of St. Bartholomew, kept in the Late Romanesque Bartholomew`s Choir. On your final night in Frankfurt, enjoy a delicious meal at one of the fine restaurants in the city, then head over to Kleine Bockenheimer Strasse, otherwise known as Jazzgasse (Jazz Alley). Spend the rest of your evening enjoying live music at the many great venues here. 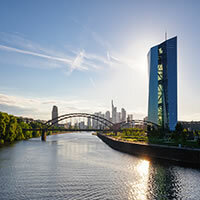 Should you be able to spend additional days in Frankfurt spend a day exploring one of the many historic towns and scenic regions in western Germany. We recommend a visit to one of Germany`s most popular spa towns, Wiesbaden. Here you can experience what a German spa is all about. Head to one of the relaxing saunas or take a swim in the several thermal pools available around the town. From Wiesbaden, head to the Rheingau wine district. Vineyards on terraced hillsides have produced wine here since Roman times. The wind-sheltered southern slopes of the Taunus range, on the river`s northern bank, get plenty of sunshine and comparatively little rain, conditions the Romans recognized as perfect for grape-growing. The Rheingau wine grapes produce a delicately fruity wine with a full aroma and these wines are among the best white wines made anywhere.